Not to be confused with Black Mamba (drug). 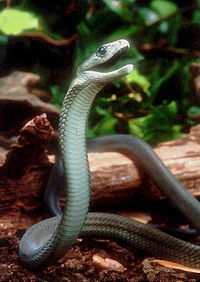 The black mamba (Dendroaspis polylepis) belongs to the Elapidae family of snakes. It is the second largest venomous snake in the world. An adult black mamba can grow up to 14 feet (4.3 m) in length. The black mamba's skin is not actually black, it gets its name from the colour of the roof of its mouth. The black mamba lives in the south and the east of Africa. They can be found as far north as Eritrea, and as far west as Namibia, and all throughout South Africa. It is known around the world for its dangerous venom. It is very fast (it reaches speeds of 12 miles per hour) and can also climb very fast. The black mamba lives 10-11 years. Black mambas enjoy rock-covered hills, forested savannah, and woods with rocks and fallen trees to shelter them. They also can be found in hollow trees and in termite mounds. If the black mamba is not disturbed, it will come back to a certain home all its life. They are typically found in subsaharan places in parts of south and east Africa. They can be found as far north as Eritrea, and as far west as Namibia, and in South Africa. Black mambas eat small mammals like rodents and squirrels. Sometimes they eat birds. They bite once or twice and then wait for their prey to become paralyzed and die. Then they eat them. A black mamba's bite is easily enough to kill many adult men. The deadly poison takes between 30 minutes to 3 hours to kill, in most cases. Unlike most snakes it has enough venom to bite many times in a short period. A black mamba usually attacks the head of its prey if possible. For this reason a black mamba can raise itself to a height of almost four feet. When the males and females are done mating, they go back to their homes. In two to three months the females will lay 6-17 eggs, which will hatch in 2-3 months. Black mambas do not interact with each other besides mating. They do not try to raise their young. When the female lays her eggs, she will put them in a safe place and leave them. The babies have to defend themselves from birth. Young black mambas stay in the egg for 2-3 months, and then they break through the shell with an 'egg tooth.' They are almost fully developed when they hatch, and they already have venom glands and can defend themselves mere minutes after their birth. Black mambas mate in the early springtime. The male snakes will find a female by following their scent. When the male black mamba finds the female, he will inspect her with his tongue. Male snakes will fight a lot during the mating season. They intertwine their bodies and raise their heads up to one meter off the ground. It looks like dancing. ↑ "National Geographic Mamba profile". ↑ 3.0 3.1 "Deadly snakes of Africa". Krysko, Kenneth L. Mamba. World Book Advanced. World Book, n.d.
Schott, Randy. Dendroaspis polylepis - black mamba. Animal Diversity Web. University of Michigan, 2005. This page was last changed on 18 May 2018, at 14:06.